Welcome to Deacon Xavier Champagne-Deuve: He was born and raised in Paris, along with his twin brother and has a Master’s degree in History from La Sorbonne. He lived in the USA for 20 years mostly in Los Angeles; Deacon Xavier worked in telecommunications and after returning to “school”, obtained a Master’s degree in Landscape Architecture from Cornell, eventually setting up his own business with his twin (also a graduate from Cornell). After 10 years in landscape Architecture, he felt a call to enter the seminary. He was ordained as a deacon last June for the Institute of the Good Shepherd, an institute of pontifical rights with the exclusive use of the extraordinary form and is am now in his final year of formation at St Vincent de Paul Seminary in Courtalain, located in the diocese of Chartres, France. He says that “It has been a long journey but God has his plan”. Lenten Extra Daily Mass: Have you been yet? Next week our last Lenten Preacher: will be Fr Barry Hallett (Dorchester). Laetare / Mothering Sunday: Today we are at the mid-point of Lent and Mother Church allows us to relax a little from the fast with flowers on the altar & the organ being played. The liturgical colour is softened from violet to rose & the Mass begins with the words “Laetare Jerusalem” (Rejoice Jerusalem). We contemplate the motherhood of the Church which is exemplified by our Blessed Lady herself. On this day we honour mothers & pray for them whether they are living or dead. We pay tribute to all of you who have worked hard to bring up children as this is the most important job in human society. God bless Mothers! Fr Lukasz is still in Poland with his Mother. Please keep him and his family in your prayers. Thank You to everyone who came, helped and supported our St Patrick’s night last weekend, especially the Cronin family who organised it all. We raised £569 towards this year’s Bazaar fund and £589 which will be sent to Parkinsons UK (this includes a £20 donation made on the night). UCM Cake Sale & Raffle: Today after the 9.30 Mass, the UCM will be holding a cake sale in the club to raise money for “Hot meal for every child”. Please come along and support. Special Sunday - 11am Today: Performed by Cantores Missae under the direction of Charles Finch. Readers Rota for April to June: Now available in the Church Porch – please collect your copy today. 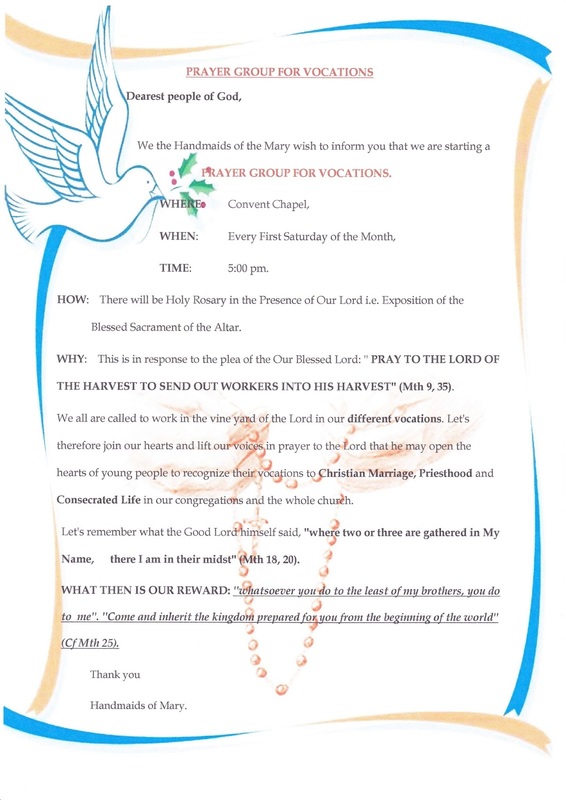 Prayer group for vocations: Last month our nuns, the Handmaids of Mary started a prayer group which will meet every first Saturday in the convent chapel at 5pm. 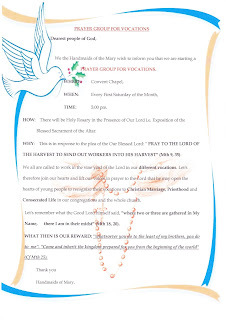 There will be Rosary and exposition of the Blessed Sacrament. Please see the poster at the back of Church for more information. African & Caribbean Association: will have a meeting straight after the 9.30 Mass next Sunday. Saturday 8th: 4.30pm Confirmation Programme starts. Meeting at the Presbytery for Candidates and parents. Wednesday 12th: 11am Mass of Chrism at St George's Cathedral (Confirmation candidates are required to attend this). 7-9pm Tenebrae.